Were you the sort of child who would watch all sorts of animals buzz about the garden? I remember being mesmerized by humming birds, butterflies, spiders even roly-poly bugs. I just loved watching, observing, thinking about what these animals were doing. A beautiful new picture book, Step Gently Out, celebrates this moment for children - the wonder of watching animals, looking closely at their world and ours. Step outside, take some time to be still and just watch the world. Get down low to the ground or close to some plants, and you're sure to see tiny animals going about their business. Frost and Lieder have captured the wonder children experience as they notice these creatures. Lieder's photography will be the first thing to grab children's attention. Each page brings the reader up close to an insect, as if you were right there crouching in the garden. The animals are caught in crisp, clear detail that will fascinate children. The colors in each photograph and the balance between sharply focused animals and soft backgrounds are stunningly beautiful. Moreover, Lieder's photographs perfectly interpret and complement Frost's poem. Just look at the beautiful title page - I love the color of the thistle this bee is perching on. The balance between the sharply focused animal and the soft background complements the text perfectly. Frost introduces animals children will be familiar with - an ant, a honeybee, a moth - and some that may be new to them - a firefly, a katydid, a damselfly. With each, Frost uses just a few words to capture its essence. Her poetry capture the magic of the moment and never overwhelms the young reader with its artistry. Frost manages to balance concrete details with just a few perfectly placed lyrical phrases. Yes, I know I'm gushing, but I adore this book. It took my breath away when I read it, and it keeps pulling me back again and again. I second Travis Jonker's suggestion - this is certainly a book that could either be considered for the Caldecott for its stunning photographs or the Newbery for its beautiful text. 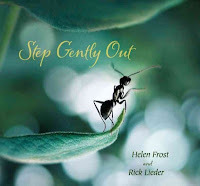 Step Gently Out has received several starred reviews. Three favorite reviews are: Travis Jonker's 100 Scope Notes, Corey Doctorow's Boing Boing, and Anita Silvey's Children's Book-a-Day Almanac. I purchased this review copy at my local bookstore, the wonderful Mrs. Dalloway's Books in Berkeley. If you make a purchase using the Amazon links on this site, a small portion goes to Great Kid Books (at no cost to you!). Thank you for your support. I saw this book for the first time on the "to be cataloged" shelf of a book cart at a school library. What a treasure! How beautiful, beautiful it is. Glad you featured it.